Like the 2015 Open Internet Order repealed by the FCC in December, S.B. 822 extends to the state’s 40 million residents a host of legal protections aimed at reigning in the power of Big Telecom—a handful of companies that sell internet subscriptions to nearly 100 million U.S. broadband customers, many of whom live in neighborhoods with only a single provider option. Around two dozen states pushed back after the FCC vote, legislatively and with executive action. Most of the bills are now dead, but of those that did succeed—Oregon, Washington, and Vermont have each enacted net neutrality legislation—none are as thorough in replicating the Obama-era protections as California’s. “I’m very grateful to the governor for really taking a hard look at this and understanding that if the federal government refuses to protect net neutrality, that California has a responsibility to step in,” said Sen. Scott Wiener, S.B. 822’s principal author. While other laws, too, prohibit companies such as AT&T and Verizon from throttling or block internet traffic on a whim, the interminably named “California Internet Consumer Protection and Net Neutrality Act of 2018” also cancels out a number loopholes not addressed in the underlying rules of the 2015 order, but in the 300-pages worth of explanations that accompanied it. It prohibits ISPs from intentionally congesting or degrading web traffic for the purpose of imposing unreasonable fees on companies that connect users on ISP networks to other parts of the web, also known as interconnection. Moreover, the law explicitly defines access fees—which ISPs imposed arbitrarily on app and content providers in order to reach end users—as a form of illegal blocking. Wiener’s bill, co-authored chiefly by Senator Kevin de Leon and Assemblymembers Miguel Santiago and Rob Bonta, attracted a fierce advocacy online and national relevance symbolically, not only as reprisal for the FCC vote, but as a framework for other states looking to obsolete it. The Electronic Frontier Foundation named it the “gold standard” of state net neutrality laws. 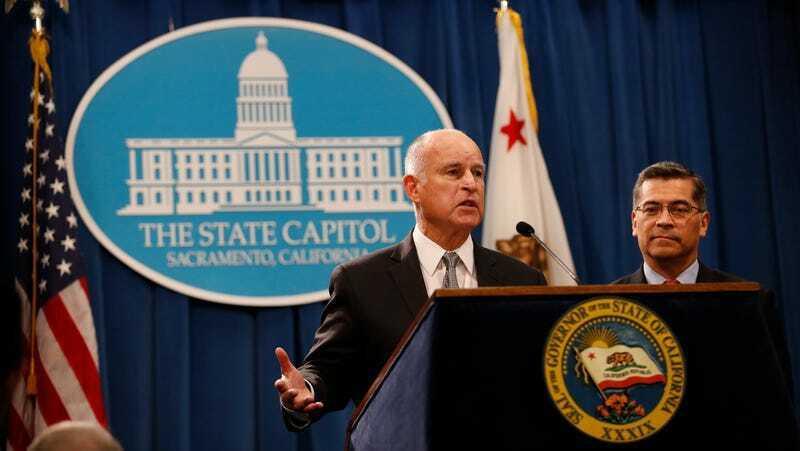 Democratic Leader Nancy Pelosi and Senator Kamala Harris both publicly supported the bill, with Pelosi pressuring Brown to sign it week, telling reporters she was sure that “pretty soon” California could be congratulated. The law will now face significant legal challenges, if not from the FCC itself, then the ISPs that have already promised to sue. “It’s very odd that Ajit Pai and the FCC apparently think that this unelected agency has the power to stop 50 states from acting to protect the internet,” said Wiener, conceding the industry has a right to ask the court to interpret the law. Update October 1: The Justice Department is now suing California over the law, the Washington Post reports.